Dirk Gently has seen better days since his last adventure. Despite having saved the world, he’s now reduced to palm reading in order to eke out a living. When a wealthy executive seeks his services to protect him from a goblin and its hairy, scythe-wielding associate, Dirk seems to have finally caught a break. Sadly, said executive is later found sans head. In a tightly sealed room. Looks like the man’s claims weren’t as crazy as they originally seemed and Mr. Dently is soon off on another bizarre adventure that somehow involves Norse gods, an I-Ching calculator, and much much more. As was the case last time, I have not read the original source material (although listening to the audio drama version does make me want to seek it out). A little online research reveals that alterations were definitely made in the story’s transition to radio, including the addition of familiar faces from The Hitchhiker’s Guide to the Galaxy. While some claim the characterizations and humor have been dumbed down from the original source material, I think it’s perfectly enjoyable when taken on its own. All six episodes of the 2008 radio series span across 3 discs for a combined total of 3 hours and 17 minutes. In addition to the liner notes, this release features extended versions of the episodes that include material that didn’t make it onto the air. 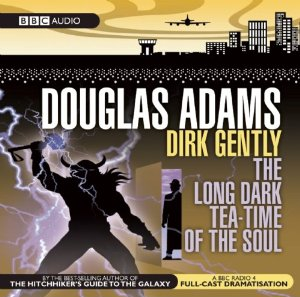 Although successful enough to justify plans for an adaptation of Douglas’ unfinished Dirk Gently adventure The Salmon of Doubt, the planned radio version was sadly never realized due to both producer Dirk Maggs leaving the company responsible for the radio adaptations to form his own company and the decision to pursue a (short lived) television series based on the first two books instead. It’s a shame, as I would have loved to hear the cast of the radio series in action one last time.